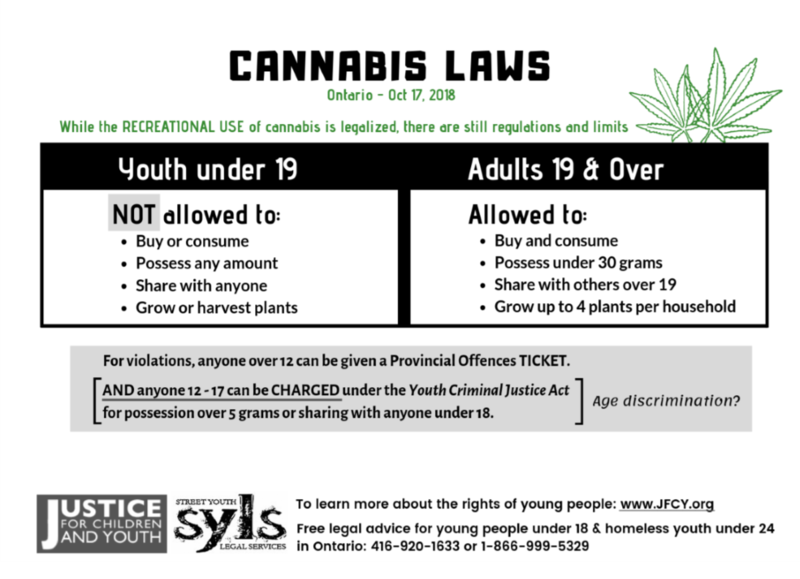 Adults over 19 years of age can possess recreational cannabis as of Oct 17, 2018. No, there are still regulations and rules. This is similar to alcohol and tobacco. While there are federal laws that apply across Canada, the Provinces and Territories will each have their own laws that may restrict further. Also, within each Province and Territory, the local municipalities (cities and towns) and private places (eg. employers and landlords) can restrict even more. For example: the Ontario government allows for use in some public places, while the City of Markham within Ontario does not allow for any use in any public place. If you are travelling within Canada, you will be subject to the laws of the Province and municipality you are in. There are also different laws on Medical Cannabis (see below). If you are travelling outside of Canada, it is illegal to take (recreational and medical) cannabis across international borders. 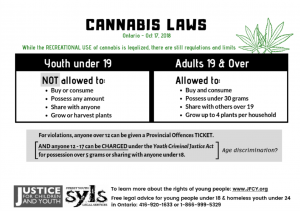 Can youth under 19 have recreational cannabis? Are there rules on when and where I can use recreational cannabis? Anyone who breaks the rules can be given a Provincial Offences Ticket – see the Provincial Offences section of our Legal Wiki. And anyone who is 12 – 17 years of age can be charged under the Youth Criminal Justice Act for possession over 5 grams or for sharing with anyone under 18 – see the Youth Criminal Justice section of our Legal Wiki. What happens if a break the rules in school? The laws on having drugs at school has not changed. A suspension may be considered for a student under the influence or in possession of cannabis; and a suspension will be required and an expulsion may be considered if a student gives cannabis to someone under 19 – see also our Education section of the Legal Wiki. Is it discrimination that a young person can be charged while adults are not? JFCY is concerned that a young person 12 – 17 years of age may be subjected to criminal sanctions and records, whereas an adult cannot be for the same offence(s). Some of these concerns have been also raised in a Robson Crim Blawg post. Where can I get more information about recreational cannabis? The Ontario Government and the Federal Government have websites that are designed to educate the public about all their laws on the recreational cannabis. As the laws are new and more questions will be raised in the near future, JFCY will update this section as changes occur. What about the use of cannabis for medical reasons? The use of cannabis for medical purposes is not age restrictive and there are different rules on buying and amounts that can be in your possession. To qualify for medical cannabis, you must have a medical document given to you by a doctor or nurse practitioner. You can not just tell your school, workplace, or the the police that you use cannabis for a medical purpose.